On Wednesday, Koru 1 had a project based learning day. Children learning with Mrs Harris explored geometry through dance and children learning with Mr K explored the effects of music. First Mrs Harris played us an amazing video that showed us how we can use our bodies to create shapes and patterns. We discovered that we would be creating our own dance sequence that day. To begin we needed to revisit what we know about geometric patterns. We completed two art based activities so that we could demonstrate our understanding of reflection and rotation. It was now time for us to head outside and explore dance and movement. We learned about an 8 beat rhythm and used our creativity to come up with some cool dance moves. We experimented with different levels by stretching our bodies wide, tall and low. We also learned the difference between locomotive movement and non-locomotive movement. It was exciting sharing back our ideas and seeing how creative everyone could be. After morning tea, we discussed how we would configure our groups. Some of us chose to team up in groups of 3 or 4 while others went in pairs or even solo. We created a check list of things we would need to do in order to be successful team member. We spent the middle block creating a dance sequence that would show our understanding of translation, rotation and reflection. After lunch it was time to take the stage. Everyone performed their dance and listened to feedback from the audience. It was a proud moment for many watching it all come together. We ended the day with a discussion about what went well, our challenges and where to next. 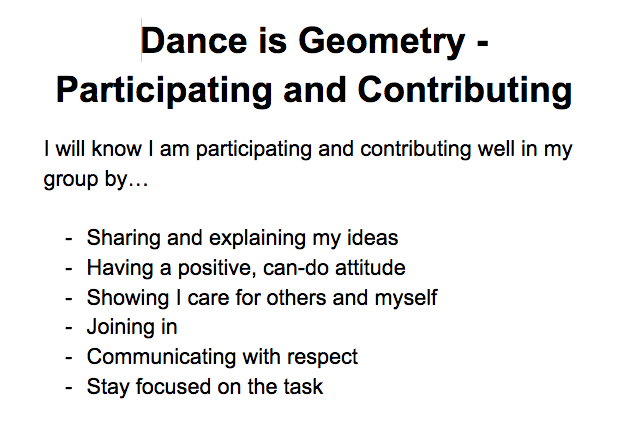 Next week we will be blogging about our experience and be sure to ask us to show you our geometric dance moves.